does xj6 stuff also work for xj6c? same swb chassis? and since all the electronics are John Lucas (Prince of Darkness), they will act just the same (letting the smoke out). they sell jz adapter mounts so rewiring the whole chassis and using my own gauges would be in order. i trust british wiring about as far as i could throw the typical brit woman. which is not far. theyre big. LOLed probably a little too hard at this today. We know this to be true because every time one lets the smoke out of an electrical circuit, it stops working. This can be verified repeatedly through empirical testing. For example, if one places a large copper bar across the terminals of a battery, prodigious quantities of smoke are liberated and the battery shortly ceases to function. In addition, if one observes smoke escaping from an electrical component such as a Lucas voltage regulator, it will also be observed that the component no longer functions. The logic is elementary and inescapable! The function of the wiring harness is to conduct the smoke from one device to another. When the wiring harness springs a leak and lets all the smoke out of the system, nothing works right afterward. Starter motors were considered unsuitable for British motorcycles for some time largely because they regularly released large quantities of smoke from the electrical system. 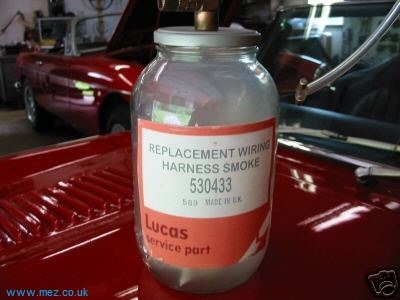 It has been reported that Lucas electrical components are possibly more prone to smoke leakage than their Bosch, Japanese or American counterparts. Experts point out that this is because Lucas is British, and all things British leak. British engines leak oil, British shock absorbers, hydraulic forks, and disk brake systems leak fluid, British tires leak air and British Intelligence leaks national defense secrets.